Well here's my next build for this GB. She somewhat stalled a little bit when I went visiting up North and it took a little while to get going again. 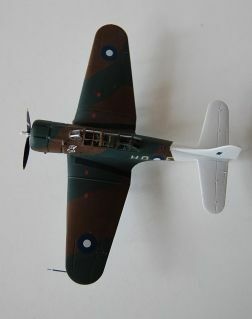 In mid 1943 No 4 squadron exchanged their Wirraway's for the Douglas SBD-5 Dauntless. This change of role also saw them change from the previous squadron codes of QE to HQ (rumours have abounded for years that this was never officially promulgated but was caused by some confusion in the paintshop at the time the codes were applied to the new aircraft ) The RAAF had looked at both the Vultee Vengeance and the Dauntless for the dive bomber role but came down on the side of a de-navalised version of the Dauntless as this enabled greater commonality with their allies in theatre. 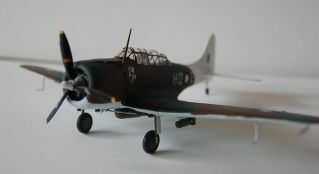 No 4 squadron kept their Dauntless until early 1945 when they were reequipped with Helldivers for the invasion of Java. So here we have A27-200 of No 4 squadron bombed up and ready to go on another mission in support of the ground troops from their Port Morsby base. 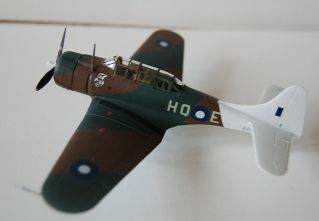 The kit is the Hasegawa SBD-5 Aeronvale version which already includes an option for an aircraft that's been de-hooked. Very nice kit, typical Hasegawa and goes together very well. I had an Eduard Zoom etch set for this, so used it. In all honesty although easy to use I doubt if it's worth it. All you can really see is the seat belts and instrument panel. The rest looked very nice fitted but disappeared once the fuselage was closed. Paints are from the Lifecolour RAAF box set (they do two) and went on very well. I really like the colour differences between this Foliage green/Dk Earth/Sky aircraft and my RAF Far East Hurricane in Dk Green/Dk Earth. The Australian colours really make it stand out from the crowd. 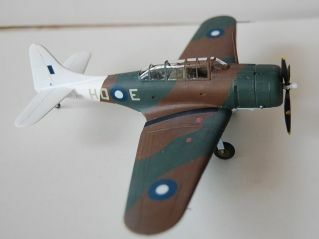 Markings came from a Special Hobby Wirraway - squadron codes, national markings and personal marking - the serial came from a Special Hobby Vengeance as I figured the Dauntless would have got the Vengeance serial No's in real life (A27-***). I enjoyed this build and am now tempted to do either an Aussie Helldiver or maybe a New Zealand one. Very nice, Chris. Looks the part! Put that on a contest table and you'll fool a lot of people! A nice build and a really clean finish and perfectly believable (and a few RAAF squadrons did change their 2 letter codes part-way through the war, too, so even that's realistic). 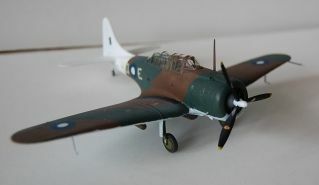 I've just purchased an Airfix Dauntless and, if it's Ok with you, will use it for an Aussierama if I get time as an extension of your backstory for the dauntless in RAAF service. Missed this thread completely - and saw the finished product at Telford. really, really nice, Chris. So your not just a pretty face,shipped onto the SIG stand for modelling eye candy ............................................no your definitely not.